As the title goes, Spicy Potato Curry is one strong curry that is perfect for a cold wintery day. 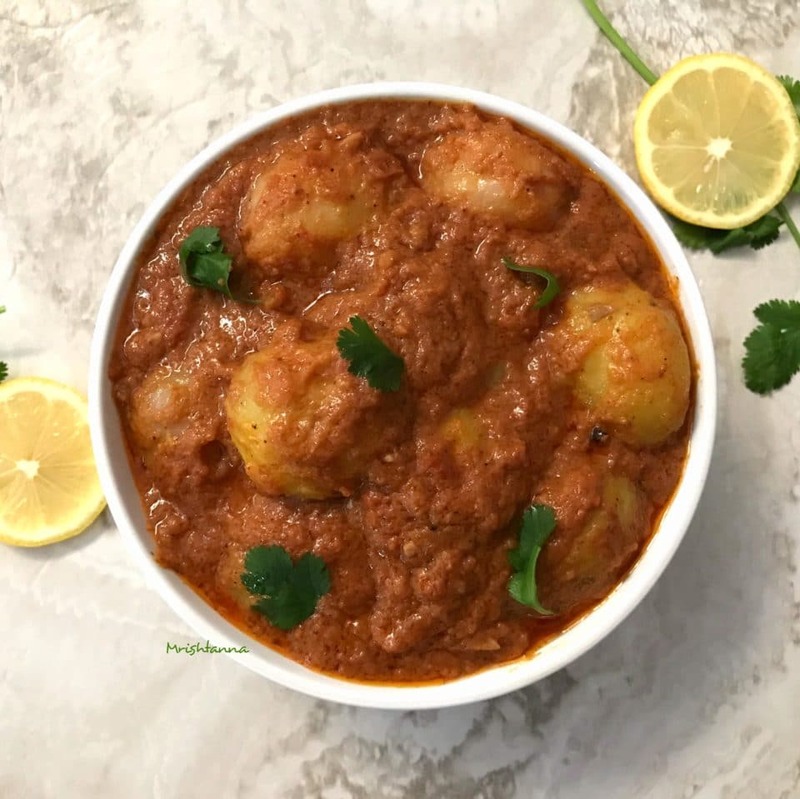 This is a healthier version of Indian Dum Aloo recipe. The original recipe calls for deep-fried baby potatoes and also requires dairy ingredients such as yogurt and cream. I am sharing an easy to prepare, a dairy-free dish that is as relishing as the original recipe. 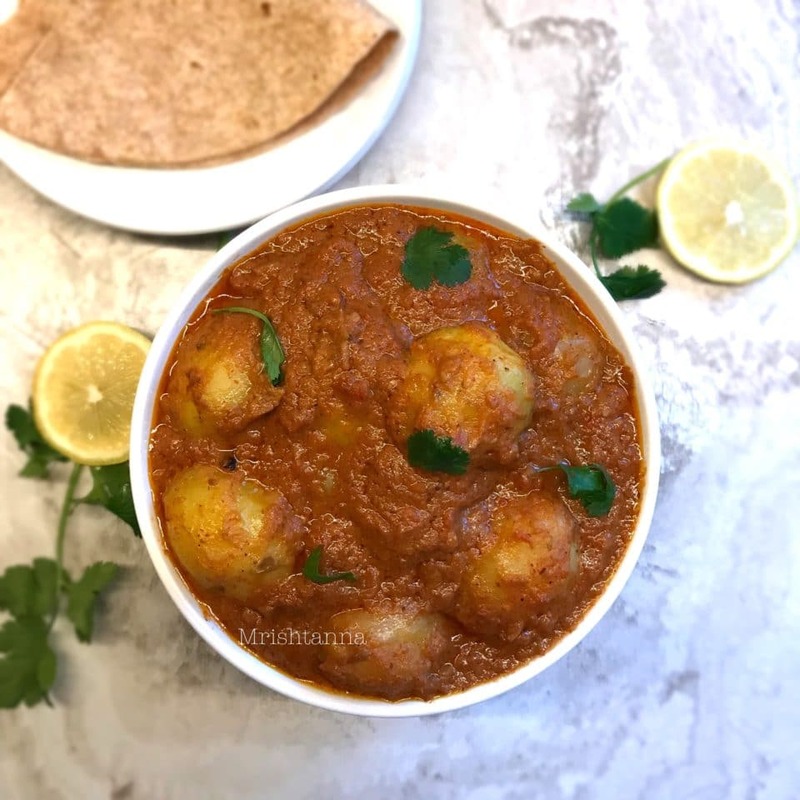 Spicy Potato Curry or Vegan Dum Aloo is a flavorful concoction of onion and tomatoes seared in spices and a rich base of cashew paste. The secret to getting the taste is to blanch the onions and preparing the curry base. I boiled the potatoes separately, but it is also quite common to boil the potatoes with the gravy. Using cashew paste and soy yogurt for creaminess also worked out very well. I had tried almond paste in a few of my trials, but it does not quite match the richness that cashews bring. If you do not have cashew paste, you can always soak a handful of them in hot water and them blend them along with the onions. If you do not have soy yogurt, add a few more cashews and a couple of teaspoons of lemon juice. I started out to prepare a vegan version that is as good as the original recipe, but it actually turned out better. Try it to believe it! I am really looking forward to your comments on my facebook page. On a scale of 1-10, this recipe will probably be classified as 7. So if you prefer a milder curry, you can always make modifications by going easy on the garam masala and the chili powder. 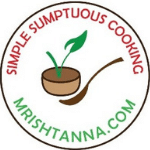 If you want my recipes directly at your inbox, just hit the subscribe button at the right. If you are new to my site, you should check out my simple but useful e-book where I put together some simple vegan dessert recipes and dessert essentials. Just hit the subscribe button and you will get a copy. Here are the recipe details. 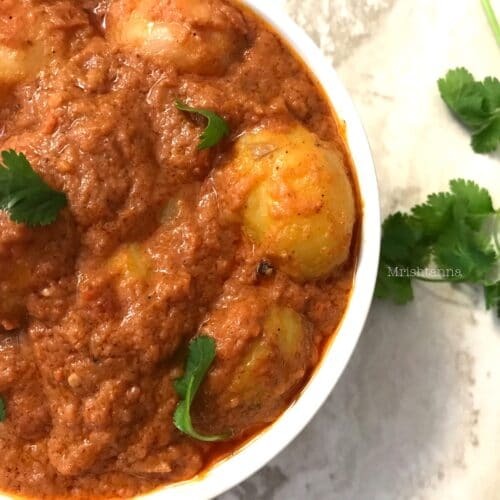 Spicy Potato curry is a flavorful concoction of onion and tomatoes seared in spices and a rich base of cashew paste. Place a pan over medium heat and boil the potatoes. De-skin the potatoes after they cool down and place them aside. In different pan, blanch the cubed onions and then blend them with tomatoes. If you are using cashews instead of cashew paste, blend them with the tomatoes now. On a separate pan, saute Bay leaves, green cardamom, Cloves and green chillies with oil. Add minced garlic, ginger and sautÃ© them until they turn golden brown. Add the blanched onion-tomato paste and stir well. Cook for 2 more minutes. Add all the remaining spices (turmeric, Garam Masala, red chili powder). Continue to cook for at least 5 minutes until raw smell goes away. Add salt, and soy yogurt and cook for another 2 minutes. Add boiled potatoes and stir well without mashing the potatoes. Let it simmer for 5 minutes. If you do not have cashew paste, you can always soak a handful of them in hot water and them blend them along with the onions. If you do not have soy yogurt, add a few more cashews and a couple of teaspoons of lemon juice. I turned this recipe into a main dish by adding cauliflower and green beans, and used Greek yogurt as a topping instead of adding the soy yogurt to the dis. It was Amazing! My whole family loved it… even my 4 year old! Thanks for sharing this… I will be adding it to my recipe box!